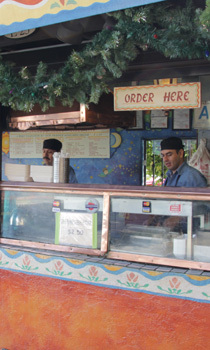 Follow the smell of taquitos muy auténticos at this LA institution on historic Olvera Street. The tiny stand has been serving freshly stuffed, rolled and fried taquitos since 1934, enough to earn its street cred title of "world famous." The thing to order is obviously taquitos, though there are also burritos and chile relleno, which come smothered in avocado sauce and optional beans and cheese. There was no running water so the water was drawn from the gas station directly behind the stand. The food was cooked at home and bundled in cloth (manteles) to be carried to Olvera Street by trolley. Cielito Lindo has a small but authentic menu including our world famous taquitos, tamales and burritos. We also offer a number of combination plates that include any of these three items with a side order such as beans and cheese and chile relleno. Several current photos of the exterior and interior of our location, our food plates and many historic pictures of events that have been celebrated at Cielito Lindo going back to the 1940's. We also have many photos of our patrons enjoying our speciality taquitos. Several news outlets have reviewed Cielito Lindo. 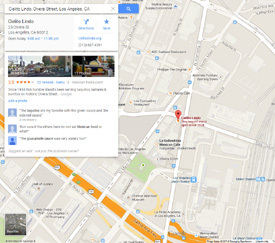 TimeOut says "Follow the smell of taquitos muy auténticos at this LA institution." NPR writes "the food stand is a Plymouth Rock of tacos, one place where the Mexican staple met a broader American audience." We at Calle Olvera celebrate events throughout the year including the Three Kings celebration, Cinco de Mayo, Blessing of the Animals, Posadas and many more. Come and enjoy these events and while you're here try one of our world famous taquitos and burritos.